When Yoshinori Kitase talks about the future of Final Fantasy, you probably want to listen. The veteran producer, widely considered the successor to former Square Enix honcho Hironobu Sakaguchi, is one of the shepherds of the iconic role-playing game series. And he’s looking to take some lessons from the world of mobile gaming—namely, player feedback. Kitase was in Seattle earlier this month to promote Mobius Final Fantasy, an episodic mobile game that’s got a loyal, dedicated fanbase. But before he started producing that game, Kitase spent over 20 years in console development, directing classics like Final Fantasy VI and Final Fantasy VII and supervising just about every Final Fantasy game in recent memory. So I was curious: what has he learned from making mobile games that he wants to bring over to console Final Fantasy? Moving forward, Kitase said, he wants to take a similar approach for console games. Does that mean Final Fantasy will follow the now-ubiquitous “games-as-a-service” model? Will Final Fantasy XVI launch on Early Access? Kitase wouldn’t get into specifics. “How to do that with a console game is another question that I would have to think of, but I do want to try to be able to have that conversation and maybe somehow get feedback while developing a console game in the future,” he said. Final Fantasy XV took an approach like that, with director Hajime Tabata and his team absorbing feedback from players on the game’s various demos, Episode Duscae and Platinum, both of which came out in the months before FFXV launched. Even after Final Fantasy XV went live, Tabata released a series of patches and updates that changed, among other things, the much-derided Chapter 13. So it’s not hard to imagine a Final Fantasy XVI that takes things even further. With that notion of user feedback in mind, I brought up the iOS and Steam versions of Final Fantasy V and Final Fantasy VI, which are, to put it delicately, not pretty. Although Japanese players seem fine with the games’ new art, North American fans have complained that there is no feasible way to play the better SNES or GBA versions of FFV and FFVI on today’s consoles. I asked if Kitase would consider putting the original versions of both games on modern platforms, and he appeared surprised at the request. “Yes,” I said, explaining that North American gamers have not reacted positively to the iOS and Steam versions of Final Fantasy V and Final Fantasy VI. That’s another part of Final Fantasy’s future. 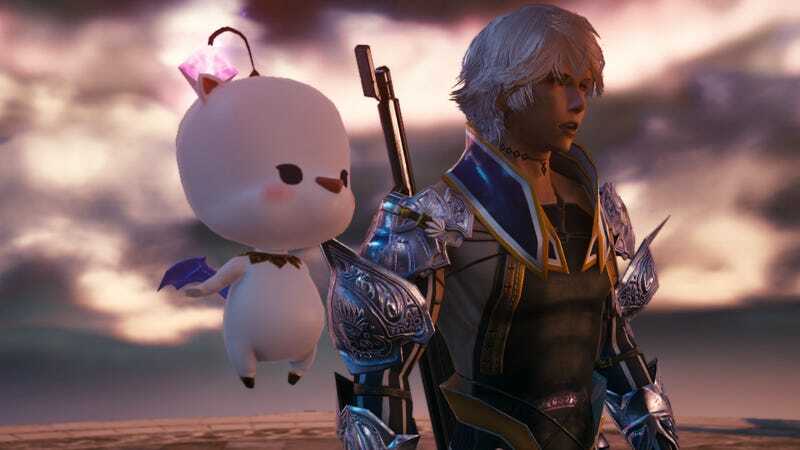 Through ups, downs, and scantily clad chocobo ladies, Final Fantasy needs to be memorable, and as long as Yoshinori Kitase is in charge, that’ll be one of Square’s goals for the series.